email will be from Shootproof. please chcek spam folder if you have not recived it within 48 hours. 6. Favorite 5 digital images within the gallery plus any additional images you wish to purchase. 10. Your final prints will be delviered to the class and sent home to the parents the same day they arrive. Please allow aprox 4 weeks. If you have any additional questions or concerns pplease dont hesitate to ask! Parents are allowed to purchase additional digital images and print products after gallery has been delivered to their email address. 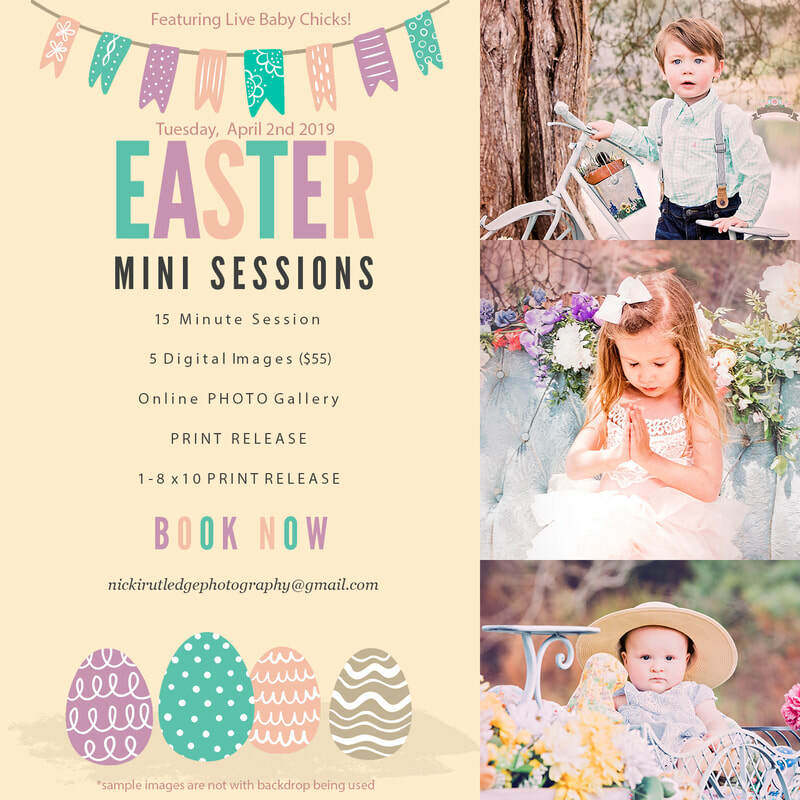 The session will include Live Baby Chicks! SO be sure to kinda start talking to your littles about the importance of being easy and gentle prior to the session just in case! That way they understand and it is a great way for them to show off their listening skills later at home! Parents please note if the contract/ waiver is not signed in advance I cannot allow your child to partake in the session. ​Please keep an eye out for this within your nickirutledgephotography@gmail.com 24-48 hours after payment has been made. Depending upon the weather we may be inside or outside. If we are indoors, I have a super cute baby blue backdrop with a white picket fence and a blue birdws nest in the tree which we will use and will be propped with a blue metal flower pedal cart perfect size for your babies! If we are outdoors, the same blue pedal cart will be used with additional props styled for Easter! To take a look at my past work pleasee visit me at my website by visiting the followin link provided. If you have any questions please feel free to send me an email! I would be happy to help! To View your Childs Image Gallery incase you never recieved your link, please visit the link provided below and look for your childs name.